We rejoin our intrepid herpetologists on the banks of the Conecuh River at 1:00 p.m. (EST). We [Sean and George] ate our lunches–such as they were–quickly, and rested by wading in the shallows and walking slowly, scanning the shallow water of the river, looking for Smooth Softshells and other undocumented species. We had another good find here as well. The shallows near the river contained a swarm of black tadpoles, which I assumed were those of Fowler’s Toads, since this species often breeds along the slack margins of big rivers, despite the legion of dangers involved in doing so. This is another species found commonly to the north in Alabama but which becomes much rarer in south Alabama. It was noted by Mount in his 1980 report but was not located by the 2006-2007 survey of Guyer and colleagues, and is not represented by a vouchered specimen, so it was one of the ones I was looking for. For all we knew, Mount could have misidentified some of the much more abundant Southern Toads (left) hopping about in this area, and perhaps there were never Fowler’s Toads here. The species is demonstrably more common just to the north of the forest in Crenshaw County, where they can be heard calling from nearly any wetland, and I had already tried getting them within the Conecuh and failed. I expected to find them breeding in Rome Pond–a perfectly suitable breeding site for them which had a population of another northern species, the Northern Cricket Frog. But so far, no Fowler’s Toads. So, I started hatching schemes of collecting tadpoles and raising them to metamorphosis before I remembered a better way to find them. 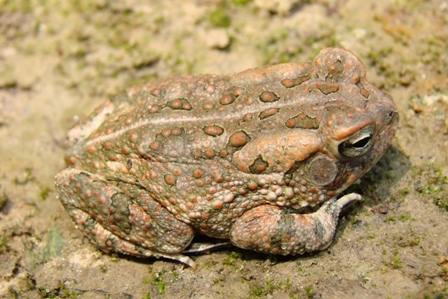 Often, Fowler’s Toads can be found during the day, hiding under rocks and logs in sandbars near these same slack sections. 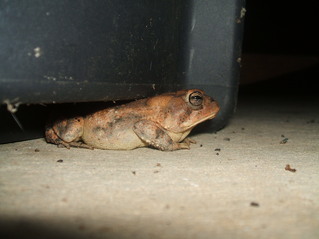 After lifting a few jagged slabs of limestone, we’d found three male Fowler’s Toads. We got good photos of them, and made sure to get illustrative photos of their heads, so that one could see they did not have the bulbous cranial knobs typical of the Southern Toad. As we headed back I realized we were in for a very long, arduous walk. The current of Blue Creek at the confluence is pretty strong, such that I almost immediately took to the bank to make better progress. But the bank had its own difficulties, primarily the thick scrub that formed impenetrable thickets of jungly briars. So it was very slow going, since we were marching back upstream. The current essentially made it feel like we were wearing shoes that weighed ten pounds. We made our way back, getting out of the creek occasionally to cut across meanders by land. It was much hotter out of the creek, and we were sweating profusely, losing water and salts. I started to feel nauseous and dehydrated only about a mile into the return hike. We stopped by a little spring with a slick of green slime to refill our water bottles, and I greedily drank it up, fighting to stay hydrated. After an hour or so of this return trek I began craving a cold beer. After two more hours, I had forgotten all about the beer and just thought about eating salty corn chips. After three hours I just thought about getting the hell out of the creek and indoors. By the time we got back to the waterfall, we were stopping every 15 minutes or so to rest. Every branch we had dodged on the way down became a major obstruction that our weary arms had trouble brushing away. Every log we had to climb over became a very slow, painstaking barrier. Crossing through dense, shrubby thickets became a major operation. I had intended on photographing the swamp honeysuckle on the way back, but never even noticed it on the return trip. My muscles began to cramp, a sign that I’d already blown through any of the salts I’d consumed in my puny lunch. By the time we got to the boggy area that I’d admired early that morning, I had not one thought of stopping to look for salamanders. The thick peaty mud of the bog was now a relentless obstacle, grabbing at my legs. I called out for George briefly, hoping he was still behind me but secretly not caring one bit. I called again and got no response. I called once more, and heard George scream. Ah, yes, at least that meant he was at that moment alive. I thought briefly about going back for him, but instead turned and continued to plod along. By the time I got back to the upper reaches of Blue Creek, where it descends in seeps from Rome Pond’s impoundment, I was really starting to be amazed at how slow my progress was, and I was in all seriousness in survival mode. That last stretch up to the open trail behind the lake, and the trail over to Rome House, must have taken me a half hour to walk. By then George had caught back up, and he appeared to be slightly alive. The last 50 meters to the house was a zombie shuffle for both of us. The cool of the air conditioned house felt like Antarctica. We undressed and began wolfing down food and water like jackals, hoping but not really caring that Jill–the other, female intern–would not come down and find us, half naked, muddy, and smelly, ravenously gulping down water and food. After a tortured shower (the hot water felt like being bullwhipped), I collapsed on a bed. I didn’t sleep, I just let my body recover. After an hour of this, and after my body became osmotically balanced, I was able to walk again. An hour after that, our sense of humor came back, and we celebrated our survival, George’s demonstrated toughness, and our discoveries with some beers. We’d been walking in the creek for some nine hours. As soon as I was physically able, I downloaded the photos to my laptop, chose the best, most representative photos of the Queen Snake and Fowler’s Toad and sent them via email to the current curator of the Auburn Museum with locality data. 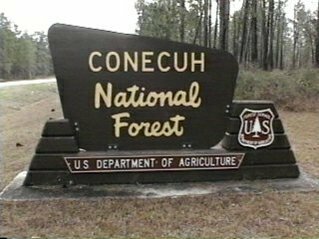 With these new finds, the official species list of Conecuh National Forest now stands at 105, a massive total for such a small area. Consider that the entire state of Pennsylvania has 26 fewer species than this national park. Consider that Alabama has only 51 species of herpetofauna that are not found within the boundary of Conecuh National Forest. The Concecuh National Forest list includes three species that are no longer expected to occur in the area, and are therefore presumed to be extirpated. 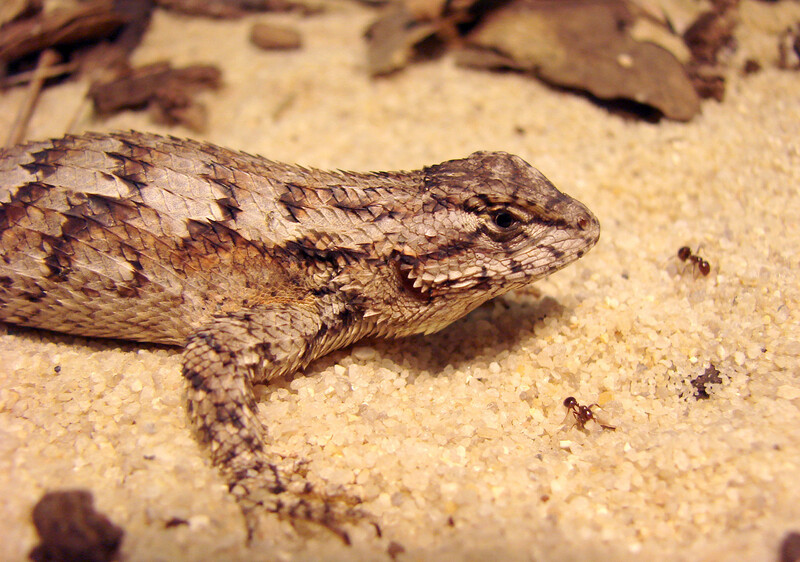 The Southern Hognose Snake (which by anybody’s best guess has been eliminated by fire ants), the Southern Dusky Salamander, and the Flatwoods Salamander. One of these species – the Eastern Indigo Snake – has been reintroduced. And one is a newcomer; an exotic species we also documented this year for the first time: the Mediterranean Gecko. 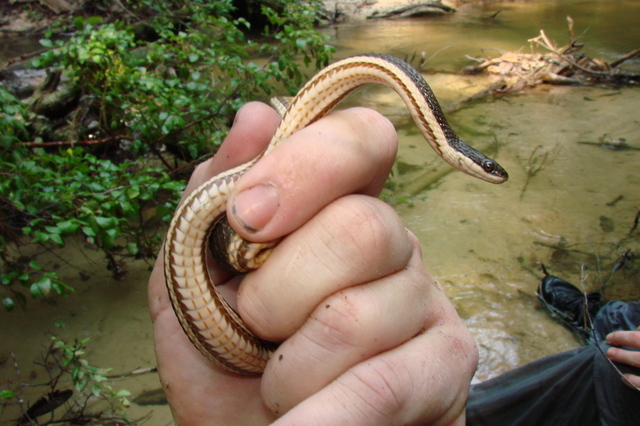 We have formally established the presence of 17 species that had not been vouchered or verified yet for the Conecuh National Forest – ranging from no-brainers like Corn Snakes to fortuitous grabs like our Queen Snake on Blue Creek – and in the past two years we have added three entirely new species to the list. How high the total goes is anybody’s guess, but due to its proximity to the continent’s most diverse region for herps (reportedly the Florida Panhandle) and to the interesting intermingling of northern and southern herpetofaunal elements, the herpetofaunal species richness of Conecuh National Forest can be expected to be as high or higher than just about any other place in the United States. 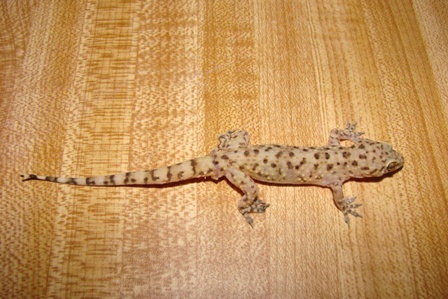 Mediterranean gecko, Hemidactylus turcicus, a new exotic species at Conecuh National Forest. Credit: Sean Graham. Categories: Summer 2012 Field Trip | Tags: by Renee, by Sean, field trip, herps | Permalink. When my intern George Brooks showed up (pictured at left), I wanted to take him for a test spin. He’d already shown a lot of gumption by contacting me about doing fieldwork during the summer of 2012, and at first I tried to turn him away, since I knew we couldn’t afford to pay him. I don’t agree with researchers who have people working for them for free, so I told him to look for a paid internship and that if he still couldn’t find one we’d look into it further. He eventually wrote me back that not only were there no paid internships, they were actually expecting him to pay them to do an internship. 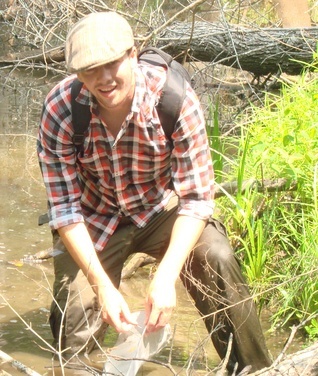 To make a long story short, we got him over here from England to do field work within Conecuh National Forest. 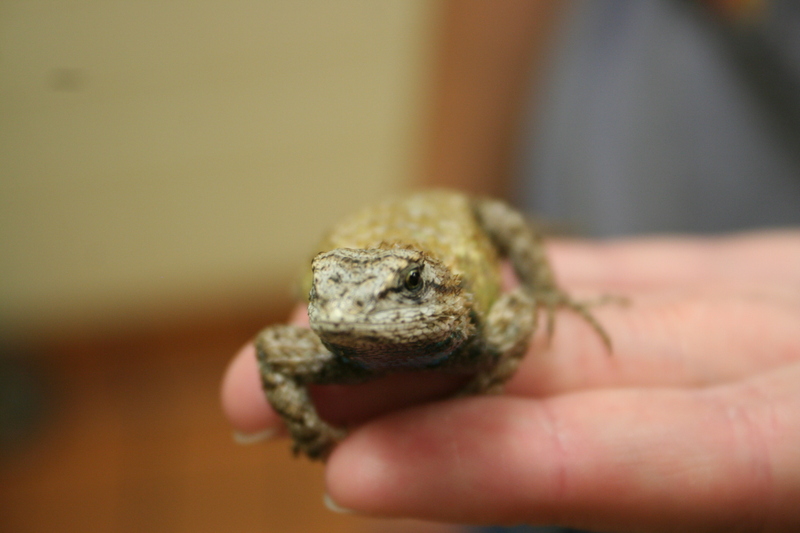 One of the main things I wanted him to do–besides helping with the various Fence Lizard projects going on–was to help me document new or unvouchered species for the forest. Since vehicle availability for him would be tricky at times, I expected him to be able to go do some productive herping right around the field house. I poured over topo maps and found that the creek draining Rome Pond (Blue Creek) flowed north right into the Conecuh River, and that there was a lot of nice topography up that way, probably indicating good hardwood forests. Many of the species I wanted to find–Brown Snakes, Worm Snakes, Queen Snakes, and Fowler’s Toads–are common species further north in Alabama but rare in Conecuh, and I thought they might be lurking in the hardwood forests north of U.S. 29. Hwy 29 forms an improbable biogeographic boundary within Conecuh National Forest because it lies along the divide between the Conecuh River to the north and tributaries of the Blackwater River drainage to the south. As such, several species usually found much further to the north in Alabama (Fowler’s Toads, Northern Cricket Frogs, Marbled Salamanders, Worm Snakes, Timber Rattlesnakes, etc.) reach their southernmost range limits at the Conecuh River and Hwy 29, which has suitable hardwood forest habitat for them and allows them to trickle south along its length like a corridor. Likewise, several species which are common further south at places in the Panhandle of Florida (e.g., Pig Frogs, Coral Snakes, Diamondback Rattlers, Pine Snakes, etc.) are less common or absent above Hwy 29. Knowing how bad creek bottoms can be in these parts, I decided we’d both walk along Blue Creek down to the river and back to check it out. It looked to be about 2.5 miles to the river, a total of 5 miles. If he was tough, he’d have no problem. We set forth on our hike during the worst heat wave of the summer (July 1, 2012), so we got up early and left the house at 7 A.M. We packed some snacks and some water, expecting to be back by lunchtime. We descended from the mucky headwaters behind Rome Pond’s impoundment, weaving through dense shrubs and vines. Just beyond this the creek met a large seepage area, complete with thick accumulations of sphagnum moss. We turned logs briefly at this area, finding Dusky Salamanders and a Ringneck Snake, and I filed away the spot in my head as a likely place to find Mud and Four-toed Salamanders in the future. Already this reconnaissance was paying off. We crashed through a thick area of sinister and well-armed bamboo vine and bays, and the creek quickly slinkied down to a smooth, white bed. We walked a few kilometers with the creek as our trail, splashing along in the brilliant clear water. As long as we stayed in the bed, it was easy going. The creek was a typical cool, whitewater stream of this part of Alabama and the Panhandle of Florida. The banks were grey, silty clay adorned with filmy ferns. We only had to occasionally dodge hanging briars, hurdle fallen trees, or duck walls of shrubs. I checked on George occasionally, asking him what he thought. We descended lower and lower along the creek, as it wound around in lazy arcs toward the Conecuh River. 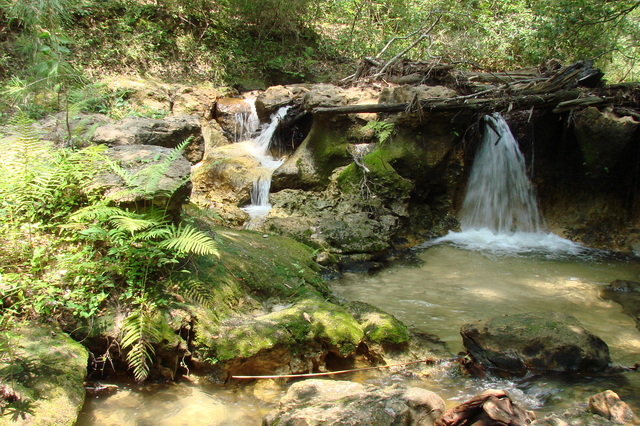 At one point the creek dashed over the ledge of a tan, pitted limestone outcrop, forming a short but pretty waterfall. 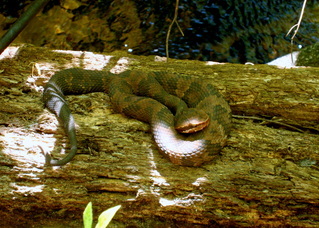 The stream’s edge was guarded by seven coiled Cottonmouths (above, credit: Sean Graham) in their characteristic ambush posture, and at one point I ducked under a blooming swamp honeysuckle–a white flowered azalea found more typically in cold rivers of northern Alabama. I felt the white corolla tube of one flower and it was nice and sticky, thus the name Rhododendron viscosum. I started scanning the shrubs along the creek, a good way to spot a basking Queen Snake. However, I explained to George that I didn’t really think it would work, since I only ever seem to see them basking in northern Alabama. Down here they probably get as warm as they need to get in the water of the creeks, and that’s one of the reasons they’re so hard to find–they don’t bask as much as they do in cooler climes. I certainly didn’t expect to find one during the hottest week of the year in south Alabama. So of course I found one. I noticed a thin, tiny tan vine along the length of a small shrub branch perpendicular to the edge of the water. Something about the vine made me study it a little longer. It wasn’t a vine, but instead what came into focus was the thin stripe of a gorgeous, olive, basking Queen Snake. I carefully unbuckled my field bag from around my waist, placed it on a log in midstream, and rushed in toward the snake. At the last minute it deftly unfurled from the shrub, and for a panicked moment I was unsure whether I had it. But I did. I held it up triumphantly toward George, who came over to see what I’d found. I was grinning and hooting, things that often follow a good find. I’d been talking about Queen Snakes a lot, so he knew the whole story when I told him what it was. I snapped pictures of it on the bank. It was a she, and a very fat she–the snake was clearly pregnant with little developing embryos. Queen Snakes, like all North American natricid snakes, are live bearers, and this particular species has one of the most specialized diets of any snake: they eat only recently molted crayfish. And now we had a second chance to formally voucher the species from within Conecuh National Forest. We bagged it as insurance (in case the camera went into the creek) and continued our trek. I started getting the feeling we were getting close to the river. Up ahead there was what appeared to be an opening. But the creek just kept on winding. Like Christopher Columbus sighting signs of land, we began seeing sure signs that the river was right around the corner: a Largemouth Bass, a River Cooter, an old wooden bridge. Still, the river didn’t appear, and as our drinking water ran out, the creek became deeper, its banks steeper. But the walk was still pleasant, and as the rushing water from Blue Spring joined our creek the terrain became truly enchanting. The steep banks of the creek were cloaked with a mature beech magnolia forests and sheer bluffs covered with angel hair ferns; surely this area would turn out to be the haunt of Worm Snakes and Spotted Salamandersif we could just find them. Gurgling springs bubbled out of the sides of the banks in places, making any worry about drinking water unnecessary. Finally, the creek became waist deep, the sand began shifting heavily under our feet, and the sandbar marking the confluence of Blue Creek and the Conecuh River appeared. It was one o’clock. Sean and George found a Queen Snake – but what about Worm Snakes, Brown Snakes, and Fowler’s Toads? What surprises await at the Conecuh River, and will they make it back to Rome Pond unscathed? (This is the “Blue Creek Death March”, after all.) Tune in next week to find out in the much-anticipated, final installment! Update: read part 1 and part 3. 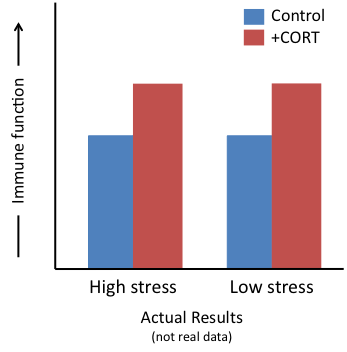 My co-op with the Langkilde Lab is coming to an end and I’m getting ready to go back to Massachusetts to start my senior year at Northeastern University (NU). This co-op has been a great experience because it truly embodies NU’s experiential learning core requirement. NU’s goal for the program is to have students gain invaluable outside-of-the-classroom experiences that they can write on their resumes. 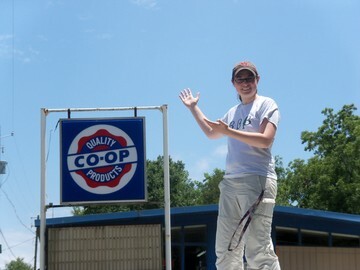 As a result, participating in co-ops helps give students the confidence they need to succeed in their field of study after their undergraduate careers. My experience with the Langkilde Lab definitely exceeded these standards. I had the opportunity to travel, submit publications (and more on the way! 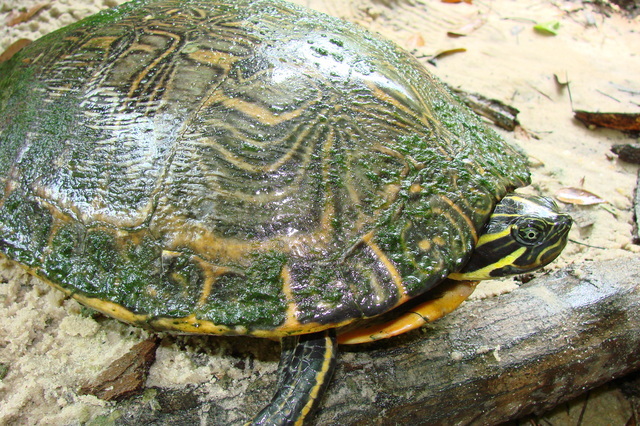 ), conduct an independent research project (sorry I didn’t talk about it more), learn about the different herpetofauna in Alabama, and network with many different people. 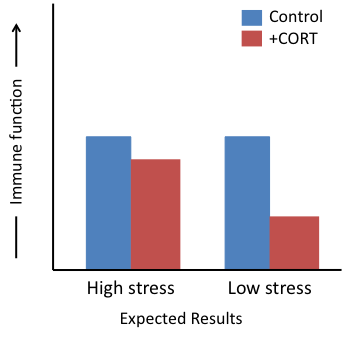 I’m very grateful to Dr. Langkilde and her graduate students for giving me the opportunity to work in their lab and to help with their projects (both in Alabama and back at Penn State). Having the co-op program as part of my education is really important to me and I consider myself very lucky to have had this opportunity. Saw a sign that said “co-op” on it and couldn’t resist! Most schools call the program that I am doing an “internship,” but Northeastern University is one of the few that calls it a “co-op.” The term is used very infrequently but I thought it was really funny when I first saw it. Categories: Summer 2012 Field Trip | Tags: blogging, by Jill, field trip, herps | Permalink. Sometimes it’s a little frustrating to experience how unfamiliar amateurs are with snakes. I love snake identification questions because they’re always so humorous. You can ask people practically anything, anything, and they’ll agree that their snake had the feature. Was it brown? Yes. Was it black? Yes. Did it have a big, purple, protruding snout? Er, I guess so, yes. I used to volunteer to field calls when I was at the Atlanta Zoo, hoping to accumulate excellent stories. Inevitably, I’d talk them through their snake’s features and it would always converge on a brown snake with stripes and a diamond-shaped head, and this would always be identified by the caller as a Copperhead. I always asked them to send me digital photos, and the snake would inevitably turn out to be a harmless Dekay’s Brown Snake. The best feature to ask about is whether or not it has stripes. 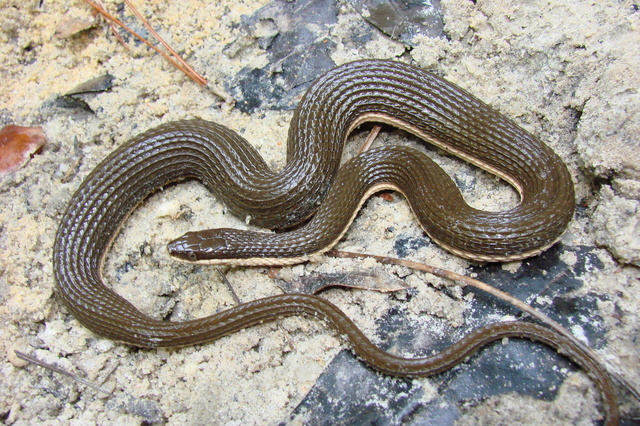 Practically any snake, viewed by untrained eyes, can be said to have stripes. Now, really think about it though. There are some snakes with stripes, such as Garter Snakes and Ribbon Snakes. A lot of snakes have bands, not stripes, but people are always saying they are striped. So back in September 2007 I was down in Conecuh National Forest–currently also my field site for research in the Langkilde lab–on the Herpetology Class field trip with my PhD advisor Craig Guyer and some other graduate and undergraduate students. We ended up down in a steephead looking mostly for salamanders when a student called out that he’d found a snake. Ok, I thought to myself, and kept digging through leaf litter, looking for salamanders. I had seen Watersnakes in the steephead, and assumed that the student had found the common Banded Watersnake, Nerodia fasciata. Nothing worth stopping for. “Wait, those are stripes, not bands,” said Nathan Burkett-Cadena, a really good naturalist and grad student in the class. I perked up, and bashed through the anise and bamboo-vine to see what they had. There are only a few truly striped snakes within the Conecuh, and I would have thought that even the dimmest undergraduate would have instantly guessed “Gartersnake” for either one of them. The fact that he hadn’t, and that Nathan didn’t know what it was, left far more interesting possibilities. I caught up with Nathan and the undergraduate, who was clearly holding a Queen Snake, Regina septemvitatta. I had read through Bob Mount’s 1980 unpublished report on the amphibians and reptiles of Conecuh National Forest and didn’t remember this species on the list. So, we carefully posed the specimen on a green patch of moss and took nice photos of it. I can still remember how the photo looked. But if this story has any moral, it is to be sure to voucher your records right away. I downloaded my pictures to the hard drive I was using at Auburn, and never got around to accessioning the Queen Snake photo voucher into the Auburn Museum Digital Herp Collections. It wasn’t a new county record, just a new record for the forest, so it wasn’t a priority for me and I thought I’d get around to it one day. Then the hard drive mysteriously disappeared. The photo–as well as many other valuable photographs–was lost. Now I should probably mention why any of this matters in the first place. For decades in herpetology, the state of the art for distribution information has been vouchered specimens. These are specimens collected and preserved and verified by an expert–usually a museum curator. Any range map for any species of amphibian or reptile you’ve ever seen is the result of hundreds, or even thousands, of dead, pickled specimens collecting dust in museums. The cool thing about all this dead herp flesh is that if you have any question about one of these records, you can go look for yourself to see what the specimen is. These specimens can also be valuable for other purposes; you can get really important information on morphology, seasonal activity, diet, and reproduction by examining museum specimens. 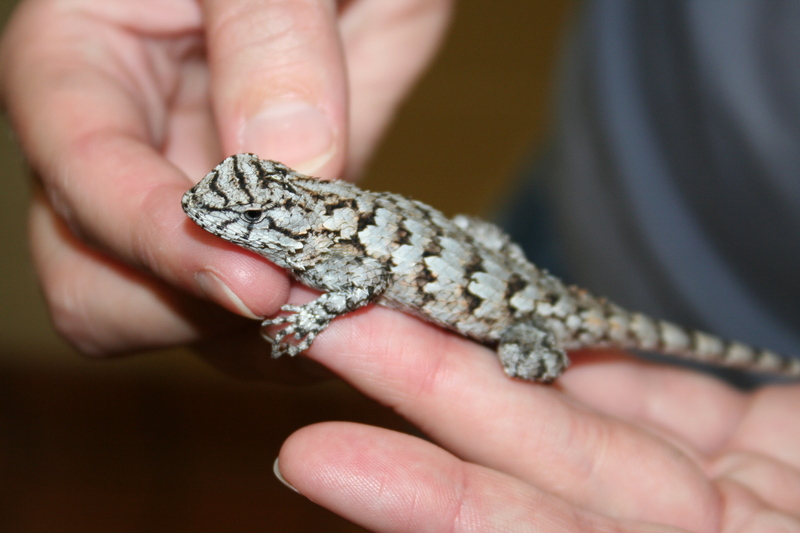 They are the herpetologist’s bread-and-butter. 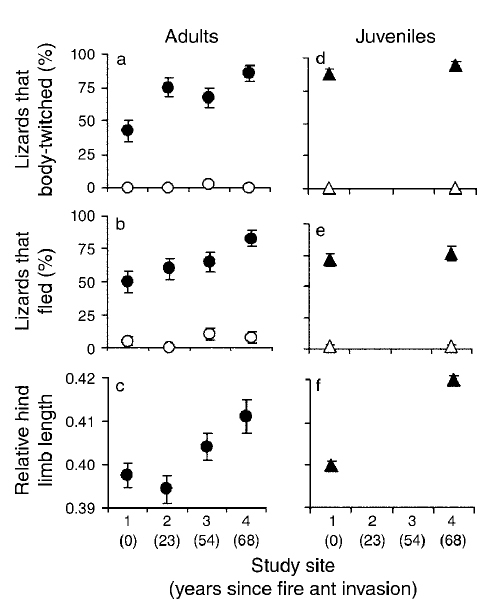 One of Langkilde’s coolest observations regarding the apparent short term evolution of Fence Lizards in response to fire ants–the fact that they used to have shorter legs in the past–came from measuring old museum specimens. Recently, due to alarm over declining populations of amphibians and reptiles, photo vouchers have become acceptable, at least for new distribution records. No need to pickle the critter. You can take a picture and let it go. Still, old school herpetologists still do a lot of collecting, and situations can occur where a photo cannot be used to establish the presence of a species, such as in cases of species that are difficult to identify unless they are in hand, or in cases in which photos evaporate. 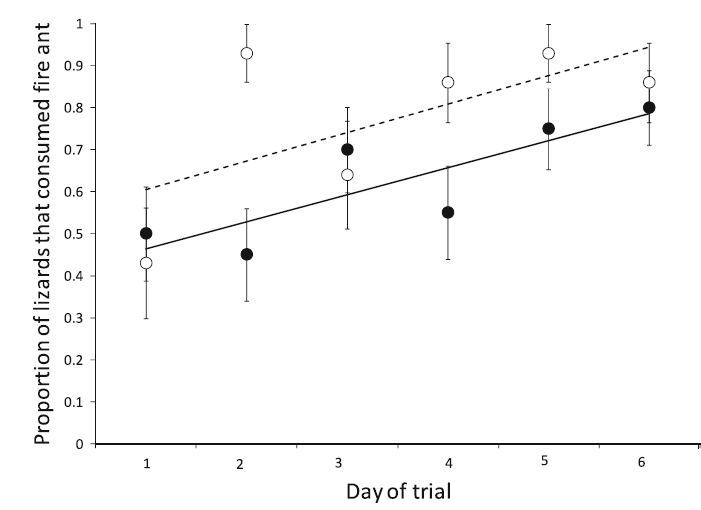 One thing most herpetologists probably all agree on is the dubiousness of sight records. 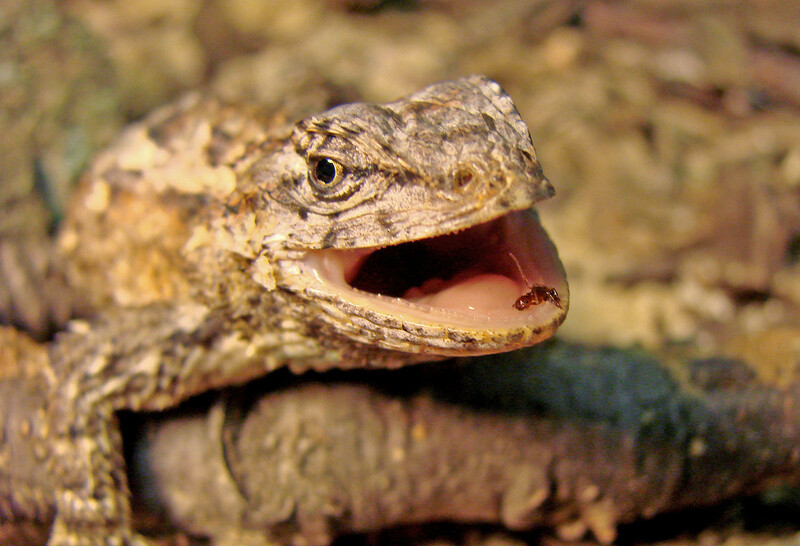 These have only recently begun to become used in herpetology, and since many herpetologists are egotistical perfectionists, it is easy to see why many are reluctant to accept a record–especially an important one–on the simple word of an observer. One of my goals for a project I initiated while doing Fence Lizard research down in Alabama was to consolidate all known information about the amphibians and reptiles of Conecuh National Forest into a big monograph. Due to our concern over declining populations of these spectacular animals, it has become very important to establish baseline information about their numbers, so that future researchers will have something to say about their status. Birders are light years ahead of us in this respect, because birders keep excellent records and have been keeping them for decades. In an attempt to keep up with birders, I published a study on baseline information about the amphibians and reptiles of Tuskegee National Forest in the Alabama Museum of Natural History bulletin series. 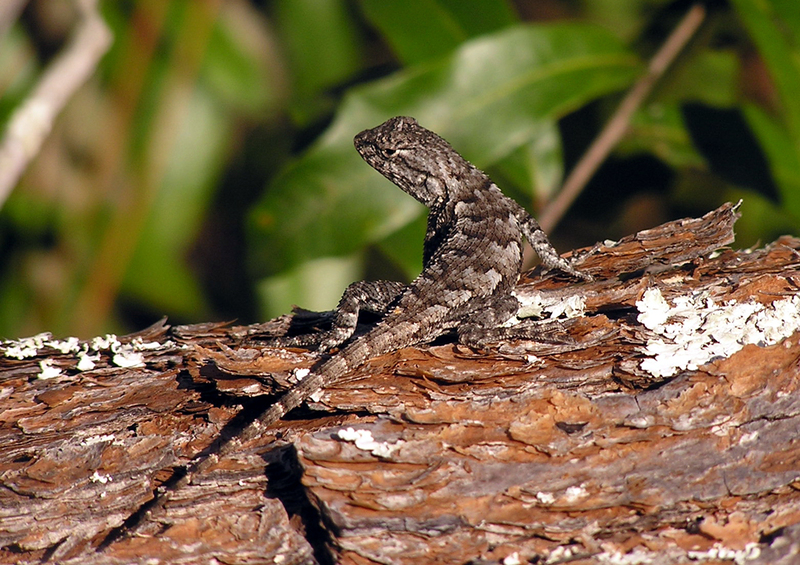 Since there is more data for Conecuh National Forest (there have been four unpublished surveys done for the forest service on herps within the forest proclamation boundary), and more species, the next one will be more ambitious. One goal was to get every single species known from the forest properly vouchered, so there would be no doubt what was here when people look back 20, 100, or a thousand years from now. The best vouchers are specimens, so we spend a lot of time looking for nice, fresh road kills to put in the museum; guilt-free collecting. Next best are photo vouchers. You will find a few sight records–filthy little things you shouldn’t completely trust–in our manuscript. 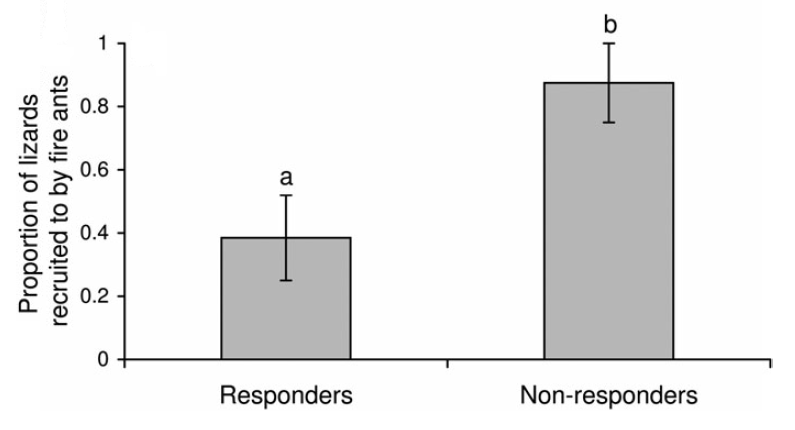 I ran into this problem in the preparation of my previous paper on the herps of Tuskegee National Forest; several species we found commonly were not represented by any museum specimens. Obviously this was because collectors didn’t think they were noteworthy enough to collect, but who knows, what if 500 years from now they are rare and people think that nothing’s changed? 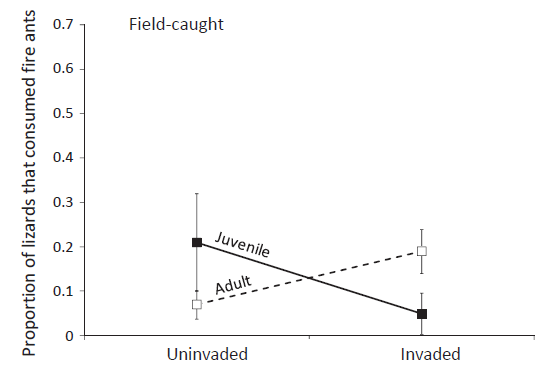 This has been the primary problem in documenting declines in amphibian and reptile populations, and one of the primary reasons for this manuscript–to establish a baseline for future comparison. And so I was kicking myself for some time about not properly vouchering our steephead Queen Snake, even though Guyer and I both saw it and agreed on its ID. Queen Snakes are probably pretty rare in south Alabama, and in some places they can be difficult to turn up. Another opportunity was unlikely. I had learned my lesson. If I ever got another chance to collect a Queen Snake, I was going to voucher it. Will Sean prevail and voucher a Queen Snake in Conecuh National Forest? Stay tuned for next week’s installment to find out, and to meet George. Update: read part 2 and part 3. Categories: Summer 2012 Field Trip | Tags: by Renee, by Sean, herps | Permalink.